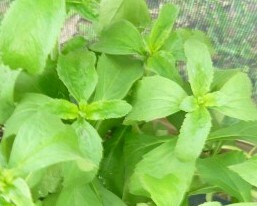 Stevia - Leaves are 100 times sweeter than sugar. Dried and powdered leaves can be used as a sugar substitute in baked goods, etc. Stevia contains no calories and is safe for diabetics. Easy to grow perennial in zones 9-11+. Can be container grown indoors with adequate light. Cannot ship during extremely cold weather. Live starter plant in 3 inch container.